Houdini's silent feature The Man From Beyond will screen at the Southend-on-Sea Film Festival in the UK on May 23, 2015. Stuart Burrell, an escapologist and stamina strongman, will do a presentation that is said to include a clip from The Grim Game. My guess is this will not be from the new TCM restoration, but will be the plane crash footage from the Kino DVD set. The official website notes that The Man From Beyond was "released in the UK shortly after his untimely death in 1926." I've never heard this before. As far as I know, The Man From Beyond was distributed via the Houdini Picture Corporation, and that was dissolved by the mid twenties. So who released the film in the UK in '26, I wonder? The Man From Beyond screening will take place at the Park Inn Palace Hotel Ballroom on Saturday May 23 at 6:00pm. For more information, check out the official website. UPDATE: According to the always amazing Joe Notaro of HHCE, The Man From Beyond was released by Unity Film Company on Dec. 27, 1926. Joe uncovered this information in a 1927 Kinematograph Year Book. More here. According to the 1927 Kinematograph Year Book (which is a London Publication), it was released Dec 27, 1926 by Unity and was 5,700 ft. Fantastic, Joe. You are amazing. Unity, eh? Never heard of them. I wonder if they negotiated the release via Hardeen. The Unity Film Company was a London-based company. It was most likely negotiated while Houdini was alive and then released after his death. You think so? I don't know. I feel like HH had cut his loses on his movies by '26 so it would be surprising to see him still hammering away on distribution deals. It's not impossible. But we've seen how Hardeen started shopping Houdini's films to the studios not long after HH's death, and this just feels like it could have been a Hardeen thing. Feels a bit opportunistic. But maybe the timing is just coincidence. How wild for viewers in the UK, only months after Houdini's death, to see him in a "new" movie called, The Man From Beyond. Oh, what the heck am I thinking? This was probably all done by Harry Day. LoL! I never said it was negotiated by Houdini; only that it was most likely negotiated before he died. And, who knows, he/they might have sold it years before he died, maybe back when he was in that business. Then after his death, Unity saw the time was right to release it. Hard to know. This is all super speculative, and the silent movie biz was pretty unruly. But it's interesting new info. The Trade Show date was May 20, 1926. What was the Trade Show exactly? Was TMFB part of it? Don't know exactly, but I believe that is when TMFB was reviewed and picked up by Unity. I think you nailed it then. Houdini arranged for TMFB to be released in the UK shortly before he died. I think this is an entirely new piece of info. I wonder if Haldane would have followed? I would love to to see advertising from this 1926 UK release. Did they acknowledge his recent death, I wonder? 1908: The Unmasking of Robert-Houdin is published. May 18: Potter & Potter Spring Magic Auction (online only). Did a contract clause kill Houdini? Houdini to Bess – "Sweetheart Mine"
LINK: Eerie ghost image–is it Houdini? 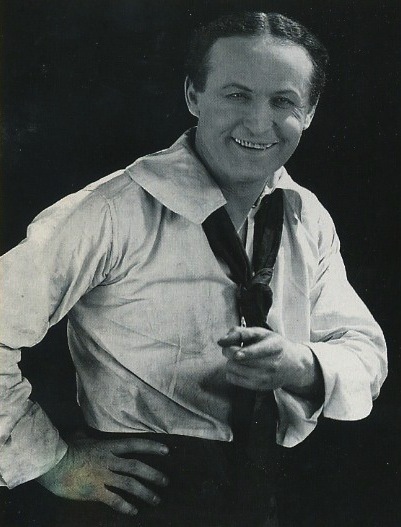 The Medium Who Baffled Houdini -? YES!--"Jim Collins is still with me"
ETSU conjure "A Houdini Experience"